﻿ Koh Yao Heaven Beach Resort, Phuket | FROM $34 - SAVE ON AGODA! "Clean great for the buck, and really quiet!" Have a question for Koh Yao Heaven Beach Resort? "Great food and lovely people to top it off." "Great stay in this amazing location." Whether you're a tourist or traveling on business, Koh Yao Heaven Resort is a great choice for accommodation when visiting Phuket. Only 40 km away, this 3-star hotel can be easily accessed from the airport. With its convenient location, the hotel offers easy access to the city's must-see destinations. Koh Yao Heaven Resort offers impeccable service and all the essential amenities to invigorate travelers. Top features of the hotel include free Wi-Fi in all rooms, 24-hour security, daily housekeeping, taxi service, 24-hour front desk. All guest accommodations feature thoughtful amenities to ensure an unparalleled sense of comfort. 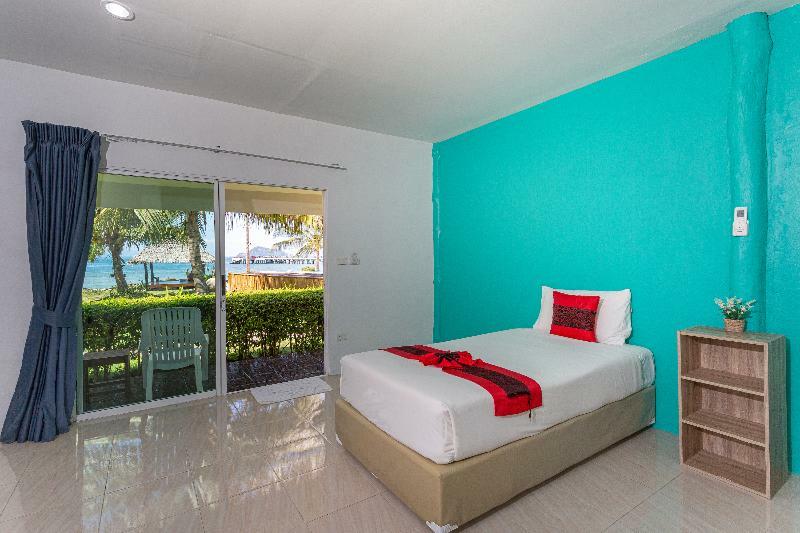 The hotel offers wonderful recreational facilities such as boats, canoe, snorkeling, private beach, outdoor pool to make your stay truly unforgettable. Koh Yao Heaven Resort is a smart choice for travelers to Phuket, offering a relaxed and hassle-free stay every time. "the rooms are very clean and aircon works fine." Due to the eco-friendly policy, the property uses an electric generator. The generator is turned off twice a day, from 10:00 AM to 12:00 PM and from 02:00 PM to 05:00 PM. A speed boat transfer service is available at an additional charge of THB 300 per person per way. The shared speed boat transfer times are as follows: - Jean Wanit Pier (Phuket town) to Loh Jak Pier (Koh Yao Yai): 10:00 AM, 11:30 AM, 14:30 PM and 17:00 PM - Loh Jak Pier (Koh Yao Yai) to Jean Wanit Pier (Phuket town): 07:00 AM, 08:00 AM, 10:00 AM, 11:30 AM and 16:15 PM The speed boat schedule may change due to weather condition. Guests are required to re-confirm the schedule with the property at least 4 hours prior to arrival. - Great location, nice and quiet. Listen to the sound of the birds and the wind through the palm trees. - Nice garden and pool, beaches. - Deluxe rooms are very basic. Plasterboard Walls with minimal sound insulation. - Breakfast is OK - Staff working their buts off with a small team. - Food in their restaurant is tasty. - Hotel can arrange pickup or dropoff at your arrival / departure pier. - would recommend as Koh Yao Yai is great and this hotel with pool is affordable. Resort is on a nice beach. And maybe it was a wonderful place in the past. But now its unfortunately not the price worth Enviroment is dirty and untidy. Pool is old and broken. Really dangerous for the kids. And unfortunately over-chlored and cloudy. Staff is friendly but lazy. In front of the resort is a pier with a large constructions site (Maybe done in 2020?) They know why they have such strict cancellation restrictions. Its definetely not worth the money. Absolutely beautiful place. Very nice friendly people. The beach right outside. Amazing value for money. 2 of us walking back to this hotel and a local man and his young son stop and asked where we was going to and gave a lift on his tuk tuk back to our hotel 2 miles away and would not take any money from us so we gave it to his son. Absolutely beautiful people. Restored my faith in kind humans. We really liked the way the hotel was built with a nice intimate pool viewing the sea We enjoyed chilling there or on the hammocks. The breakfast was good and the the staff was nice. Unfortunately our toilets smelled very bad always and that made the room not too great. Also, our room was very simple, nothing special. The toom could’ve been cheaper but all in all the place was very relaxed and we enjoyed our stay there. Beach in front of the hotel is not really nice. On low tide, you have only garbage and rocks. It's a nice place to take pictures but that's it. There are not many restaurants around but luckily there are some few in walk distance. The service of the hotel restaurant was bad. Very long waiting time and the quality poor. So we had to go out for dinner and lunch. The Room was ok and clean. The pool was great for kids but we will choose another hotel next time. In short: beach is useless - full of glass debris, sharp coral and rocks. You can try swimming when tide is up or go to another beach around the island, but you need a motorbike then. Rooms cleaned every day, but honestly not much to clean - bed, table and simple bathroom "medieval-style". TV didn't work, kettle broken, 2 electric socks for the room. Staff friendly depending on whom you had luck to meet. Sometimes shortages of water or electricity happen, so aircon shuts down in the night. Swimming pool is not really a luxury facility. To be honest- island is totaly non touristic. It's a local community with nice nature around to spend 2-3 days max. Sunsets are beautiful with the view on Phuket. It happened to be the most expensive place we stayed in Thailand, but in comparison to other places, I would be satisfied to pay 30-40$ per room and no more, so if you really want this place, look for promotions and don't believe so much in the pictures. It's all bad, dirty and old. The food is very bad. The beach is not clean. The pictures are not like reality. The bath is like from the times of war. The seaview is no sea view. You looking on bungalows. I booked 3 days and left the same days as arrival. It's no place to spend holidays. Loved my time in the hammocks! Very relaxing environment. I have several food allergies and they worked very hard to feed me. I did not go hungry! There is a small restaurant a short distance up the road as well. Go right when leaving the resort and it's on the left. Excellent food! I loved staying here. The resort is basic but has everything you need to enjoy your stay, including a restaurant. The only issues I found were the lack of a bar and that the staff could only book two tours for you, when there seem to be other options on the island. Otherwise a fantastic place for the price. It was close to the pier & have a pool. The room was totally full of ants. The shower was good warm and good pressure. But the room was absolutely not like a resort. Excellent venue. Lovely to relax around the pool or beach. Far from the bustle of phuket, and city life. But being secluded, do expect to pay more for foods etc. We really enjoyed our stay and would come again. All Thailand beaches are suffering from plastic pollution and this beach is no different. One would think that they would do something about it, as there beaches are what draws the people. Our beach was cleaned daily- but a short walk beyond the resort, reveals a plastic paradise. Very sad. We spent here 8 nights and it was the worst hotel we had ever been! Reasons why you shouldn't go to this hotel: 1) From 9am to 2-3pm electricity turns off and on (every 5 seconds) so you're without air conditioner, manager of this hotel explaining that half day they do something with generator, but when I come and say that's impossible to be in room, she shouts to her worker and he turns on. So if should be in your your room e.g. work or study- DON'T GO HERE! 2) Manager doesn't care about her guests; 3) The food is terrible and portions are very small! 4) When you eat homeless cats always looking for food and going around your table; 5) The pool is dirty; 6) The shore full of rocks and sand is not clean; 7) Housekeeper doesn't clean bathroom; 8) Staff look to you like they hate you, never smile and greet (except gardener and young girl waiter); If you come just for 2 days maybe it's ok, but not for longer time, BE SURE! The worst experience in Thailand and all travels. First of all if you are expecting to find a 5star resort, it's not it. However the rooms are very clean and aircon works fine. Most rooms have seaview. There is a swimming pool. There was a tide when we arrived but the next day the sea was good. If you want to book this resort I recommend you to call them and ask where you should get on the boat in Phuket. Where we got on the boat goes to the other side of the island, then you would need to take a ride for another 30 minutes. Great stay in this amazing location. Also right next door is a the white house restaurant on the beach. Great food and lovely people to top it off. Disappointing experience, not worth the price that we paid in my opinion. On first sight the accomodation looks nice, the outside area has a pool, hammock and swings at the beach. But after having a closer look, we noticed that it was untended. The pool water was not fresh. The room was simple, towels dirty, bathroom door was not easy to open and close, tubes showing - everything was equipped very simple. A look in our fridge: smelly food from the guys before us. Also the breakfast disappointing: American breakfast contained white (unhealthy and cheap) toast, eggs, ham and sausage that looked like chemicals, some fruits - only eggs and fruits were enjoyable. The beach - there are tides and with ebbs you only see stones and rocks, not so nice. The pier next to it is in construction currently. Plastic trash all over the beach. We don't complain very fast and I would not if we would not have paid the highest price of our whole Thailand experience. But all in all, it was just too much.